You're a little nicer because I don't care if my dad is unhappy with me. This definitely goes back to the fact that he probably doesn't care whether or not I even get married, much less if he walks me down the aisle. However, for some reason, now that there's a major event that he's not contributing towards, he's mad I didn't invite his 6 siblings, their spouses, and my 10 cousins, all of which I haven't spoken to in years. And all of a sudden I'm being invited to family functions on that side. It's very, very frustrating. I'm dealing with this exact situation. Our decision (after talking to my dad) was to ONLY invite my dad's siblings but none of the cousins. We were able to shorten the list by almost 30 people by making this decision allowing us to invite friends who truly are "family" to us. We discussed with my dad about having a separate reception for just his family but in the end, the feelings were the same. That's a lot of time, money, and planning to spend an afternoon with people who truly don't mean that much to me. We decided against it! And to be honest, once we made this decision regarding our guest list it has been smooth sailing. We had to remember "This is our day and we will do what we want"
I think if you go with a set standard like Amy Jo mentioned (no cousins invited, or something), then people won't feel so offended. That way people won't take it personally. Best of luck, the guest list was by far the hardest part of our wedding planning. I come from a huge family that is always all invited to everything (which leads to 200 guests weddings, min). Anyone who had invited my fiance somewhere by name and one guest suggestion by each parent. 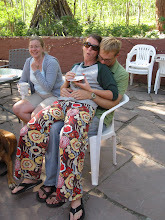 We did end up sending out an email to everyone announcing our engagement and saying that we were having a tiny wedding, but would have a picnic in the park many months later to celebrate with everyone. We didn't actually end up having that picnic, but it made us feel better. Any relatives we've seen that weren't invited have congratulated us and whispered that we were brave and smart - and they wished they'd had the guts to do what we did. Oh my gosh, the dreaded guest list. My best piece of advice is to do what you and your beloved want the most. While, yes, it is important to you for your dad to be happy... ultimately it comes down to the fact that it is your wedding, not his. So while it's really difficult to ignore the strong opinions of those you love the most, at the end of the day, you guys need to do what makes the two of you happy. We had a very similar situation. 8 siblings on my mom's side, 7 siblings on my husband's dad's side. Add in spouses, all their kids and their kids' kids. Plus my Dad remarried and I have 6 step-siblings. We have friends who we are much closer to than many of those relatives. So our solution was to have a very small wedding, a couple close friends, very small bridal party and aunts, uncles and immediate family. It got up to about 70 people, but it felt very intimate. Then we invited all of our cousins, the next level of friends, etc. to the reception that night and there were about 250 people there. It worked for us because we felt surrounded by the people we were closest to, who would actually help us and hold us accountable in our marriage, during the ceremony. Then we were able to have a huge celebration with everyone that night. It was perfect. Good luck! We are facing a similar issue. (Doesn't everyone?) We're keeping the number at 100 total, which basically gives us room for close family and friends. My fiance's mother was kind of mortified that we were having such a "small" wedding (they are from Long Island, home of the mega-wedding) so she is throwing us a "reception" a few weeks later for people who are not invited. Now, this reception has a budget as big, if not bigger, than our acutal wedding and my future MIL is inviting 90 (yes, 90) of her "closest" friends to it. It's not something I'm really looking forward to, but it's allowed us to have the wedding we want to have. 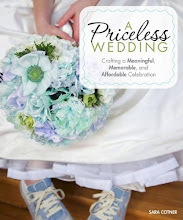 I agree with Sara that wanting a "small" and "inexpensive" wedding are two different things. 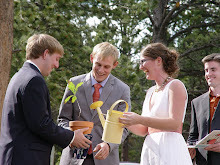 We invited 170 people and had an inexpensive wedding (well, relatively! it ended up around $8000). And honestly, it was amazing looking out at that large group of people and thinking, "Wow. These people love us so much that even though I only speak to some of them once a year, they wanted to come celebrate with us." It was a very powerful feeling to be part of that kind of community for a day. But if you want small, you want small! There are a lot of very good reasons to have a small wedding. I'd suggest finding out more about your dad's reasons for wanting his entire family there when he walks you down the aisle. Is it reciprocation, because he's watched them do the same thing? Is it because that's just the way things are done? Is it continuing a tradition, feeling a link to those who have done it before and those who will do it in the future? Is it to show off how much he loves his family? And then, are there other ways to accomplish those things? Always remember.... It's YOUR wedding and should be done YOUR way. That said, I can't tell you the number of times I've looked back and wished I had done a few more of the "little" things dad asked of me. This is our 5th Christmas without him. I wish I could make him smile or laugh one more time. The guest list was one of the most feared aspects of wedding planning for us when we started, but luckily it hasn't been so bad. Before we even thought about who would or wouldn't be invited we decided on a number. 70 guests, no more, no less. From there, we picked out our closets friends and family and consulted with our parents about who they would enjoy having at the ceremony and reception. We just kept that magic number in mind the whole time. Here's what happened to us: When we started planning our wedding, we wanted to have it be TINY (like, only our parents and siblings, under 20 people), mostly because we wanted it to be intimate and low-key and cheap. But when we told our parents that their siblings and the midwife who delivered my fiance and the 8 person family that lived next door to them for 20 years weren't invited, and when I told my friends that not only could they not be bridesmaids, but they also weren't invited, I was devastated by the sadness we were spreading with our plans. So... we decided that "affordable" and "positive" were our key ideas, and we opened up the guest list to EVERYONE who heard about it and expressed interest in coming (except on obnoxious friend on a friend that I felt compelled to blacklist)... so the midwife and the second cousins and the old neighbors and the college buddies all showed up. We ended up with just under 100 people (luckily not, like, 300), and we loved the chance to spend time getting to know guests we didn't know that well. The wedding turned out to be a 3-day affair with tons of dinners, BBQs, bonfires and s'mores, and it cost about $2500 for the whole weekend. And it was awesome. It worked for us. But it wouldn't work for everyone. we had two guest lists for our wedding: those invited to the ceremony and dinner (family and close friends), and those invited for cocktails and dancing (i.e. after dinner. Mostly less-close friends, but people we like to party with). To make the after-dinner crowd feel a bit more involved, we waited to cut the cake until after most of them arrived. it worked out GREAT! 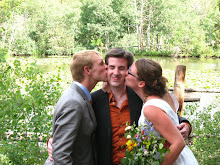 We saved money by feeding fewer people, and maintained an intimate feel to the "wedding, proper". No one on the second guest list was the least bit offended that they didn't "make the cut". They were just happy to celebrate with us. I'm from an uber-large family too, and opted to not invite cousins etc. that i hadn't seen in years, or had never met my now husband. We're having a very similar problem; I counted up parents, siblings, nieces, nephews, aunts, uncles, and first cousins, and between the two of us that made 110 family members. JUST family - that number doesn't even include the bridal party. And both of us are pretty close to most of our first cousins, so it wouldn't make sense not to invite them when we WANT them to be there. It's a tough situation because we're trying to have a mega-budget wedding, but still invite everyone we love. It also doesn't make sense for us to have a small ceremony and then bigger reception, because a) we're hoping to have both events in one location and b) a lot of our guests are traveling from out of town and it seems rude to say "Oh, you can drive/fly all this way to see us, but you can't actually see us get married. Sorry." So, since our concern is price...we're doing the catering ourselves. Really simple stuff, like pimento cheese sandwiches and veggie trays. It's not about giving our guests a fancy-pants dinner; it's about getting them together to celebrate our new marriage with us. Of course, another issue is venue; a lot of places we can afford only allow 60 guests. We're looking at the local botanical gardens, which is THOUSANDS of dollars less than most places we've seen, so if that's an option in your area, check it out. You can also go to your city government website and look at which parks are available, as well as some national parks (my friends got married in a national park a couple years ago - it was cheap and gorgeous). You can also keep in mind that out of the people you invite, not all of them will show up. That's encouraging to us as our guest list has grown to 200+ (which seems HUGE to me, but is really just family and close friends we both want to be there). so we're keeping it at 50 and thank goodness my parents have come around. our firm rules- no cousins. except... except on my mom's side my cousins are getting married two weeks before our wedding and we are invited. so on mom's side cousins are invited. sigh. at this point I really couldn't care less- because of family stuff, we have to hope a few won't attend so we can invite friends we really want there. which is a little sad. but then, my parents pointed out that if we don't invite certain relatives taht's all fine for us, but WE won't have to deal with the aftermath (i.e., living in a tiny village where my parents will have to deal with the flak). which is very selfish. i'm crossing my fingers we can keep it to 50. In my social circle its quite acceptable to invite some people to the ceremony, and not the reception. We're religious, and most of our friends value the ceremony the most; many are also from big families and big communities so people generally understand the cost problems. I've been invited to two weddings now where the ceremony was followed by tea and cupcakes outside the church for "everyone and their dog", and a smaller reception was held later. That said, my fiance and I are reluctant to go that route because our wedding is pretty far from where most of our friends are and I think it's a bit much to expect them to travel a couple of hours for only a couple of hours... So we've ended up with big (160 of which at least 80 are family) and cheap (wedding in a school, lots of DIY and help from friends, almost no professional wedding vendors).